How to download asian dramas? So you want to binge watch the whole season of a Korean drama “Descendants of the Sun“, how would you do it? Today, we’ll look into a very simple method which can save you time and bypass the unlimited number of irritating popup advertisements. 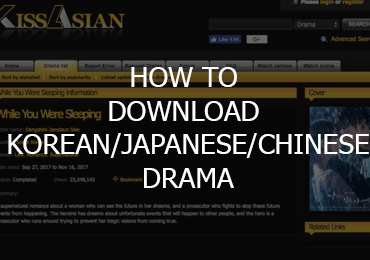 For this method, we will be using the website “http://kissasian.ch/” which is a collation of many different dramas with streaming links. Well, you could stream the shows without downloading, but downloading definitely has its perks. You can view them offline or even share them with a friend who does not have a fast internet speed. And even when the website goes down, at least you can still watch it as you want. Hence, I would always recommend downloading the video before watching. This method is only suitable for lazy people like me. Most Korean dramas are about 16 episodes. Some reality shows like Running Man is on going and is already at episode 404 at the point of writing. If I were to manually click each link and download the video individually, episode 1000 would have already be produced. Firstly, we will need to use “JDownloader” as our download client – it can do chunks download which maximises your download speed. It also allows a lot of customization which will suit our needs for this method. After downloading JDownloader, we need to add a setting which will handle our downloads. Get to the settings menu by clicking JDownloader -> Preference (OS X). The settings page will pop up and on the left sidebar, scroll down a bit till you see “Packagizer“. Click on it and click the “+ Add” button at the bottom left of the right section. For those who are lazy and would like to copy and paste, refer to this. Once done, click Save on the bottom right corner. You should see a new row being added in the table. That’s all for our configuration! Next, lets get on to the real deal – extracting the links for download. Without any links, we will not be able to download the videos. Hence, the question is how do we extract the download link from the media player? The hard work has been done for you and all we have to do is edit a few variables. We will be using this script to extract the download links. The only variables you have to change is start, end, showName and drama. As you might have guessed, start is the episode you want to download from, and end is where you want to stop. Hence you can do start = 5 and end = 7 if you want to get only episode 5 to 7 download links. Next we will update the variable showName. This will set the download file name with the correct episode prepended at the back for example “DescendantOfTheSunE1.mp4“. Finally the variable drama has to be in the correct format, often times you only have to change the name between “/Drama/” and “/Episode”. Now the script preparation is complete, all that’s left is to execute it. If you are using Google Chrome, open the developer’s console by press “F12” if you are on Windows. “Cmd + Alt + J” if you are on and Apple device. Ensure that you are at an page’s episode before executing the script. For example: http://kissasian.ch/Drama/Descendant-of-the-Sun/Episode-1?id=24583. Once there, paste the script at the Console tab. You will see the link being printed out soon. Note that there is a wait time of 10 seconds per link extraction as if you perform it too quickly, you will need to identify yourself as a human. If that case occurs, simply refresh the page and solve the bot prevention question and rerun the script again. Once all the links are printed out, you can select the all and copy. JDownloader will automatically pick up links on your clipboard. As you can see in the image below, the link matches our configuration setup earlier and our files are named accordingly. Right click on any row and select “Start All“. This will initiate the download process. Our download has now started. As we can see, the speed is reasonably fast and sometimes even faster than streaming off the site. To make the download even faster, we will need to edit some settings for JDownloader. At the settings menu, under the General tab, set the Max. Chunks per Download accordingly. (I recommend 10, it provides a stable speed without compromising your other usage on the same computer). That is it! Now just sit back and wait for the downloads to be complete. Say goodbye to the laborious process of manually going through each page to extract the link. Do view the video tutorial if you prefer animated instructions. Also, feel free to share your views on this method at the comment section below! And don’t forget to share this with your friends if you find this useful! Wa BKYL!!! Don’t hack me pls!! I’m getting an error when doing the batch link grabbing. My console automatically gets cleared when I enter the script. And with console clearing, it says pop.js:72 on the right hand side of the “console cleared” notif. Can I have help regarding this?